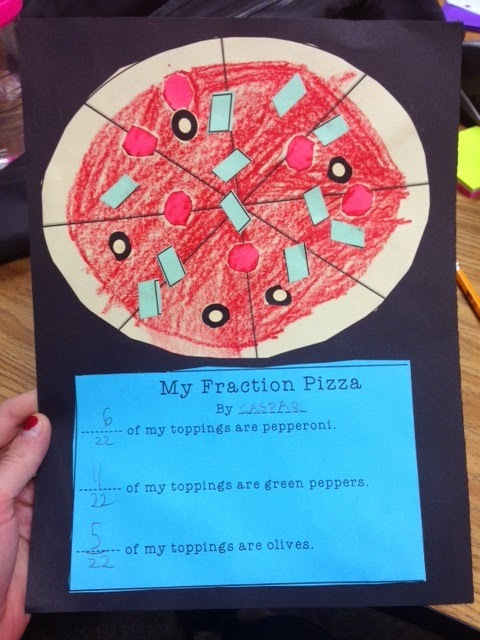 Cooking up fractions with fraction pizza! Want some fraction za? Does anyone call it za still? I never heard that term until college when an ex-boyfriend refused to call it anything but. I adored this activity today, and so did the kids. Since we do two years of math in our gifted third-grade classroom, our math unfortunately steers away from being fun. It is hard being fun when you have an enormous curriculum to cover. I was excited to bring a little fun and craftiness back into our classroom (FUN?!? WHERE ARE YOU, FUN?). Oh look, I found it. It was hiding in the za. Our county decided not to give us a snow day today. Ohmygoodness. I don't think I have ever driven in snow before today. I tend to stay home when the weather is bad, and our county rocks at deciding to give us the day off or a delay. I couldn't stop my car as it rolled down the hill from my condo complex! The main roads were absolutely terrible as well. Ten of my kiddos did not even show up today! I felt bad for the ones who came… not only did they brave the chilly snow, but mostly all we did today was our DRA testing. Not fun for them… thankfully I had this fun za activity up my sleeve to lighten the mood. I printed the pepperoni slices on red paper, green pepper on green paper, and the olives/crust on tan paper. Each student picked up each of the papers. They "cooked" their pizza however they wanted, and filled out the little chart at the end saying the fraction of each of their toppings. I wasn't sure if this activity would be too basic or hold their attention, so I was pleasantly surprised! During Closing Circle, the majority of the kids said that their favorite thing all day was "making fraction pizza"… yay! If you're interested in this activity, I put it up on TPT. $3 for a simple, no-prep activity. Ooh another pro of the day: I got to wear my duck boots! I love those things, I am thrilled that they are so in this year. With a tight pair of skinny jeans and a sweater, they are not only utilitarian but so cute. I really love the simplicity but effective (and fun) activity!